Sasha Burdin is a concert and jazz pianist, composer, bandleader, and music educator. He performed concert programs in Russia, Europe, and the US. He received MM from Bowling Green State University and Maymonid Moscow State Classical Academy, and DMA from the University of Iowa, where he studied with Uriel Tsachor. His teachers include Victor Derevianko, Naum Shtarkman, Irina Podmetina, Anna Mazarskaya, Elena Petrova, and Thomas Rosenkranz. During the 2012-2013 season, Sasha Burdin served as the principal pianist for the touring ensemble of the Center for New Music at the University of Iowa. Performances included contemporary pieces such as Gerard Grisey's Talea, Laura Schwendinger's C’e la luna questa sera?, and John Aylward's Functions of Consciousness. In 2014 with other members of Ephawk Quartet he performed Olivier Messiaen's Quatuor pour la fin du temps. The concert tour in western Iowa has gained a considerable resonance, the performance at Council Bluffs Performance Center was regarded as “miraculous” in local media outlets. In the summer of 2014 Sasha Burdin has served as a fellow at Tanglewood Music Festival in Lenox, MA. In 2015 Sasha and his colleagues Thiago Ancelmo, clarinet, and Andrew Uhe, violin have formed Nashat Trio. The ensemble performed works By Bartok, Milhaud, Khachaturian and Shostakovich. They held public performances at Laredo Music Festival 2016, Laredo Texas, Chapel Auditorium at Iowa Wesleyan University, and St. John Auditorium at Indian Hills Community College. In 2015 -2016 season Sasha Burdin participated in Johnson County Landmark jazz band as a principal pianist. The concert schedule included performances with notable guest artists Carmen Bradford former singer at Count Basie’s Jazz Band and a saxophonist Melvin Butler, a member of Brian Blade Fellowship band. Inspired and influenced by jazz music in the summer of 2016, Sasha Burdin has formed The Sasha Burdin Quartet - a jazz group, focusing on his original compositions and pieces from standard jazz repertoire, written by Miles Davis, Sonny Rollins, Herbie Hancock, John Coltrane and others. Sasha Burdin is a passionate piano teacher and music educator. He was a teaching assistant in the piano area and jazz studies at the University of Iowa. He also served as a piano faculty at Iowa Wesleyan College and at Indian Hills Community College in Iowa. 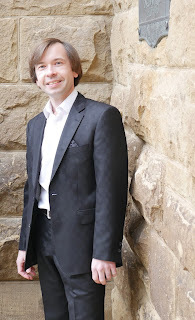 He currently holds a piano position at Pacific Piano School in San Jose, California. Nikolai Medtner (1880-1951) is among Sasha's favorite composers. In 2016 he started a collaboration with Dr. Rachel Joselson, soprano, and Dr. Scott Conklin, violin on Medtner's music. The collaboration soon resulted in a series of concerts, and a CD recording project, titled Ich Denke Dein Songs and Chamber Works of Nikolai Medtner. In the Spring of 2018 Sasha Burdin has completed his doctorate at the University of Iowa. His final thesis is dedicated to the analysis and performance of tempo and rhythmical principles Al Rigore and Flessibile in Medtner's compositions. As a part of his final doctoral project, Dr. Burdin has recorded Medtner's solo works: Tales op. 20, op. 34 No.2,3, Three pieces op.31 including Improvisation op.31 No.1, and the Second Improvisation, op.47.